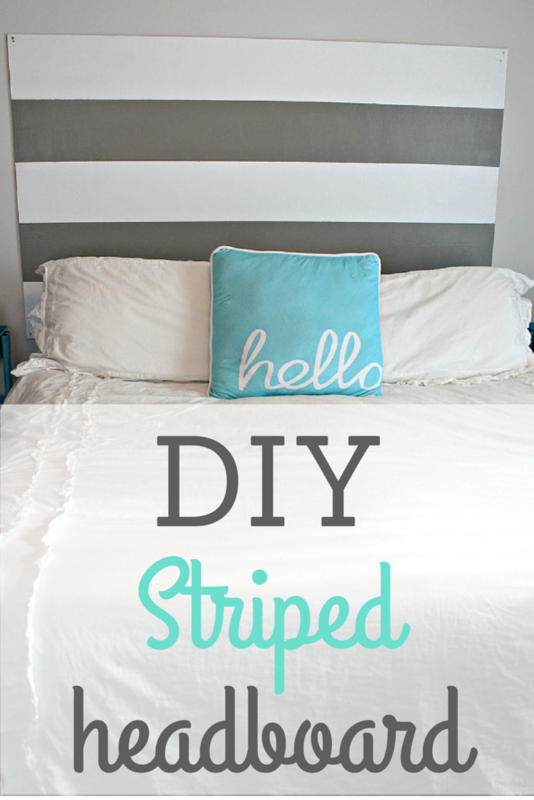 I am super excited to share this tutorial for a DIY painted striped headboard with you all today! 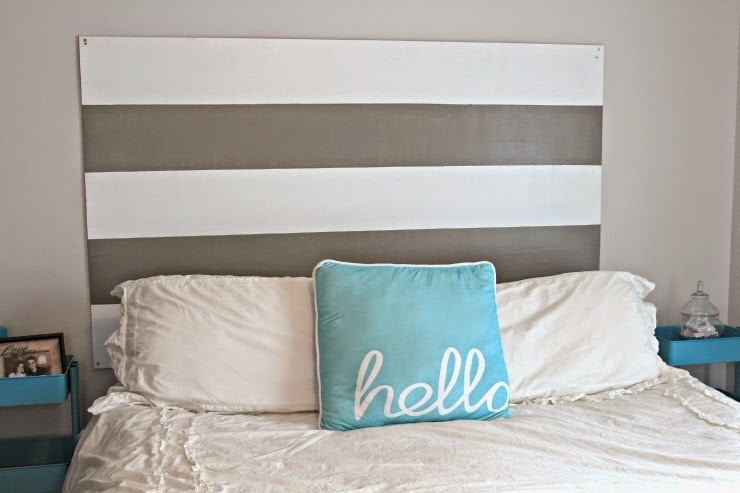 I have been wanting to make a headboard for our bed for several years now. We have never had one and it just looks so blah without one. I actually just noticed on Timehop yesterday that we moved into our house one year ago yesterday! I think we are officially past the point where any excuses are acceptable to why we haven't done something, so this was perfect timing. It took me a lot longer to get to it than I wanted, but once I got to it, it went so quickly and turned out so well! So the first step is going to be to go get your supplies. Some hardware stores will make wood cuts for you for free so I would recommend going to one of those (Home Depot for sure does). They can get it so much straighter with the equipment they have. Measure your bed and have it the exact width of your bed and then decide how tall you want it to be and have them cut at those measurements. We chose just a simple plywood that was about $13 for a sheet. I was hoping to find one that was already white but we had no luck so we just chose one that was sturdy but not too thick. I apologize for the shadowy and not the best photos--garage lighting isn't great. 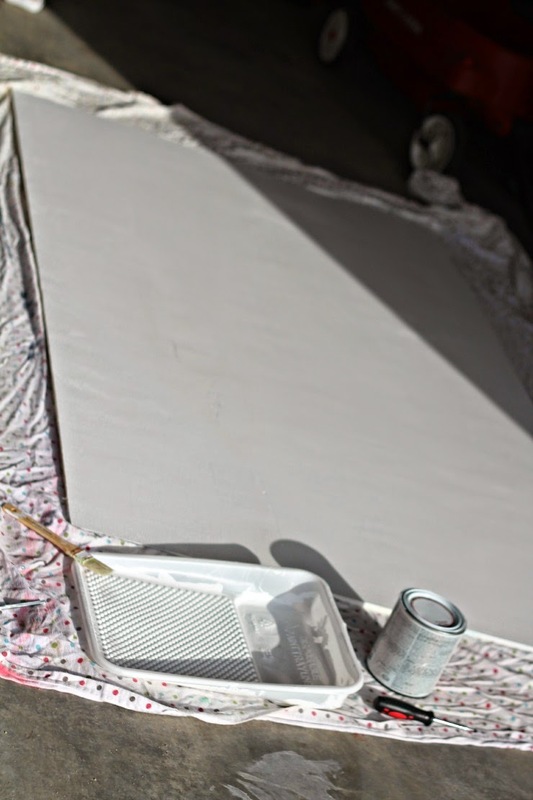 Go ahead and lay everything out and paint your board the main color, which for me was just the white that came in the can. It took me 3 coats to get it just right and thick enough and by the time I finished one coat it was already dry where I started so this didn't take long at all. For the next step I did wait until the next day just to make sure it was really dry and solidified on there and the tape wouldn't bring any of the bottom layer up. So you need to decide how many stripes you want and how wide you want them to be. 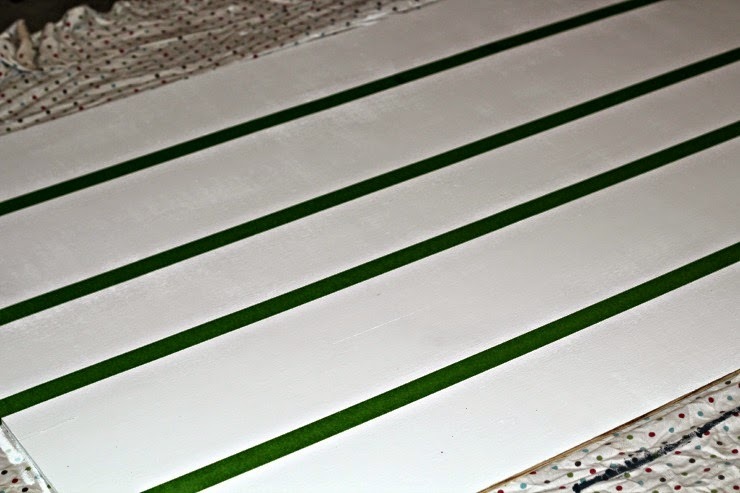 I decided on 5 stripes so then I divided the length of my board by 5 to figure out how wide I needed to make each stripe. 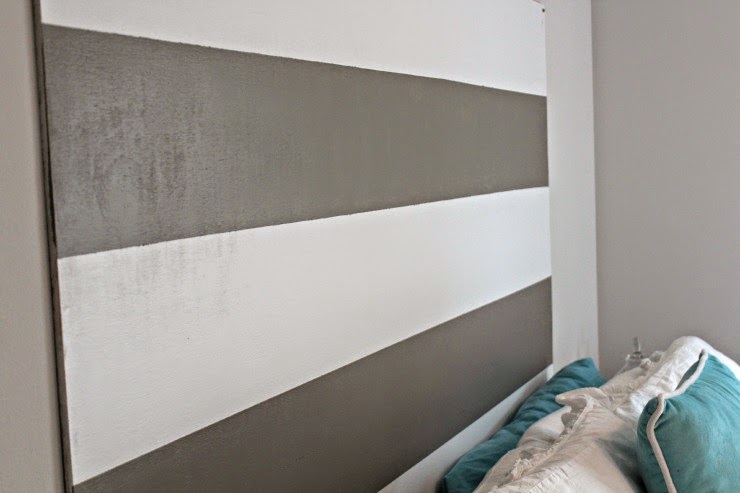 After you have done that, take a tape measure and go down the board marking at the intervals where you want the stripes to be. I just did a small pencil mark on each side of the board. My husband helped me out with this next part and I put the tape down on one side and he held it, then I pulled the tape out and we set it down on either end so it was straight. This worked out really well because we just pulled it taut. 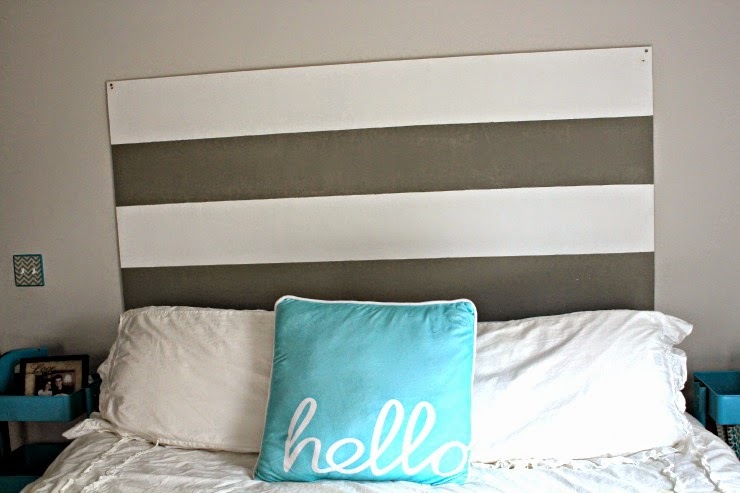 Ok after your tape is set, you can paint your stripes! Be careful to pay attention to which stripes you want painted so you don't get some funky looking stripes. 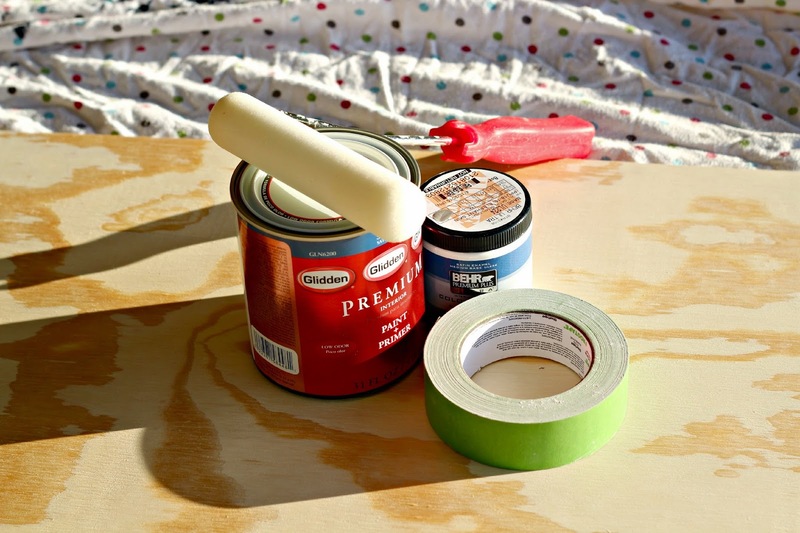 You'll want to remove your tape immediately while the paint is still wet so you don't take paint off with it. We are finally making some good progress on our bedroom and hopefully will have it completed really soon! Just a few more things to do. 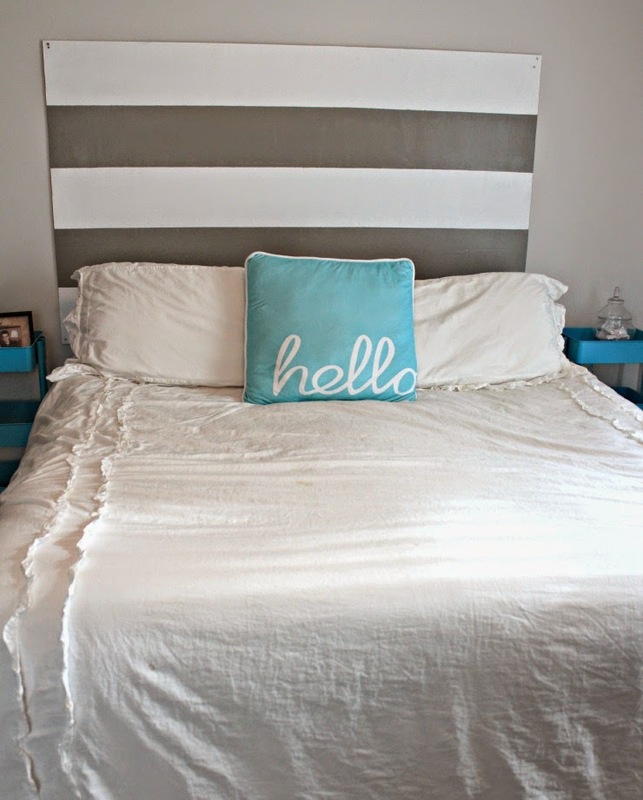 What do you think of atypical headboards? I personally think they are so fun and so many of them unique! It is amazing to see what people can come up with!